In what would only be a breather in my 20 hour day, Vandelay and I headed to Richmond for some eats. You see, my day started off at 7:00am and was not going to end until 3:00am the next morning. A full day of work, then off to Tsawwassen for a hockey pool and immediately afterwards, a hockey game in North Vancouver. There was really no reason we should have stopped in Richmond for food. After all, Bubbly was preparing some pasta for all the poolies at the draft. Yet, when Vandelay indicated that he wanted to carpool and would be available for some eats, I knew what I had to do. Although it took me o n the scenic route from North Delta back to Vancouver and on to Richmond, I could not pass up an eating opportunity. The question was where to eat? No shortage of good food in Richmond. No shortage of bad drivers either. It is indeed a catch-22. Good food in lieu of hazards to ones' vehicle. 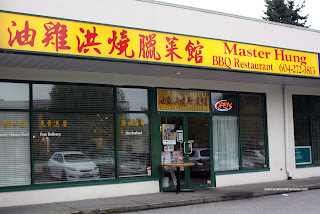 Well, we ended up traveling to a relatively calmer location on Garden City and Blundell for a quick bite at Master Hung. Not to be confused with Chef Hung, this restaurant is known for its excellent BBQ items. Of course, the first order of business is to try those items out. We got the 3-Item BBQ Platter consisting of BBQ Duck, Roasted Pork and BBQ Pork. Luckily, we got the duck breast. Hence, it was meaty and easy to eat. The flesh was moist and the fat mostly rendered. Furthermore, I could taste the duck as it was not over-seasoned with salt. Very well executed BBQ duck, no complaints here. 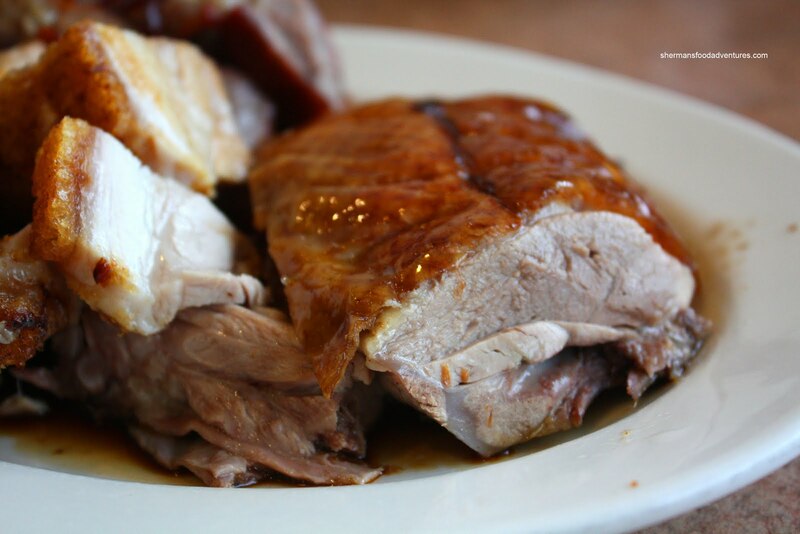 Although the roast pork arrived pretty much cold, it was still very pleasant to eat. The skin was crispy without being chewy and there was a good fat-to-meat ratio. The meat was very tender and moist while also not over-seasoned as well. I could definitely taste the roasted pork. This was executed much better than many larger restaurants. 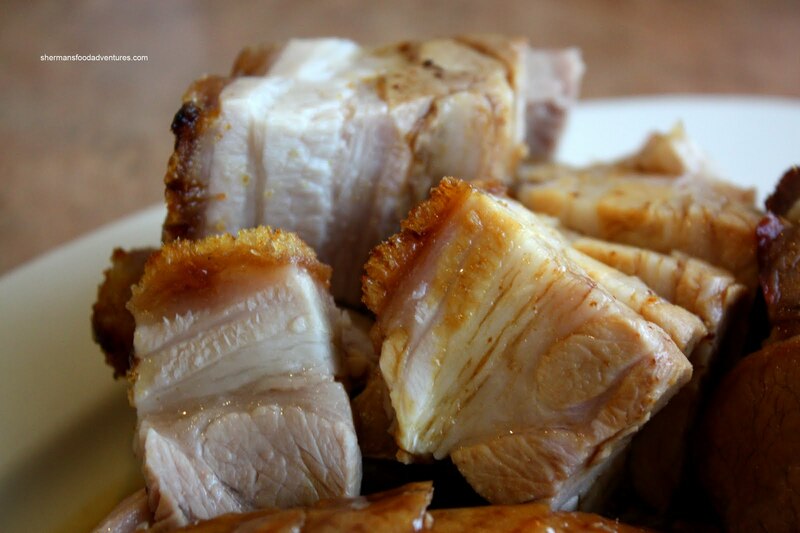 And with the BBQ Pork, you guessed it, was also very tender and moist. The exterior had a nice glaze with some charring. There was also a good mix of fat and meat as well. 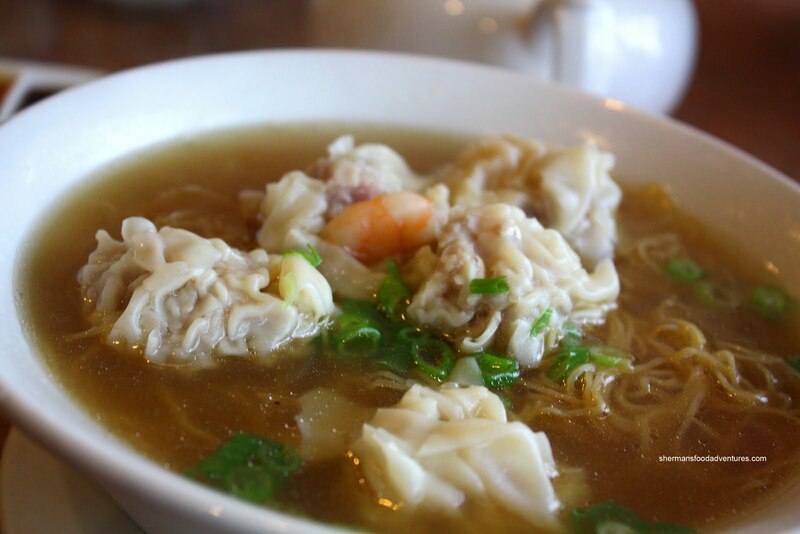 To compliment our meat dish, we got an order of Wonton Noodles. The noodles were decent with a nice bounce and chewiness. The broth exhibited nice balance between salty and sweet while providing some depth as well. I'm a bit biased towards all-shrimp wontons, so I'm usually pretty critical of pork & shrimp wontons. However, in this case, I was okay with the ones here. I liked how the pork was slightly chewy while still moist. The wontons were well-seasoned too. One minor issue. I asked for no green onions and as you can see, they did it anyways. The green onions showed up in our bowl of Liver Congee as well. Is it just me or Chinese restaurants forget or simply don't give a damn about special requests? 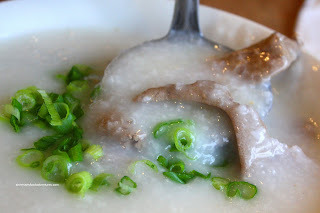 Anyways, the congee base itself was slightly thin and bland. It wasn't exactly watery; but it definitely lacked depth. It resembled home-cooked congee more than a restaurant-type version. The liver was cooked perfectly and in fact, was probably marinated in baking soda. It had a pronounced "bounce" texture, not the grittiness we normally associate with liver. Both Vandelay and I thought the food was pretty solid, especially the BBQ items. Naturally that would be an expectation since it is in the name. If it weren't located so far away, I'd probably come here for the BBQ alone. And I'm not saying this to avoid Richmond. The traffic in this area is much less apparent. 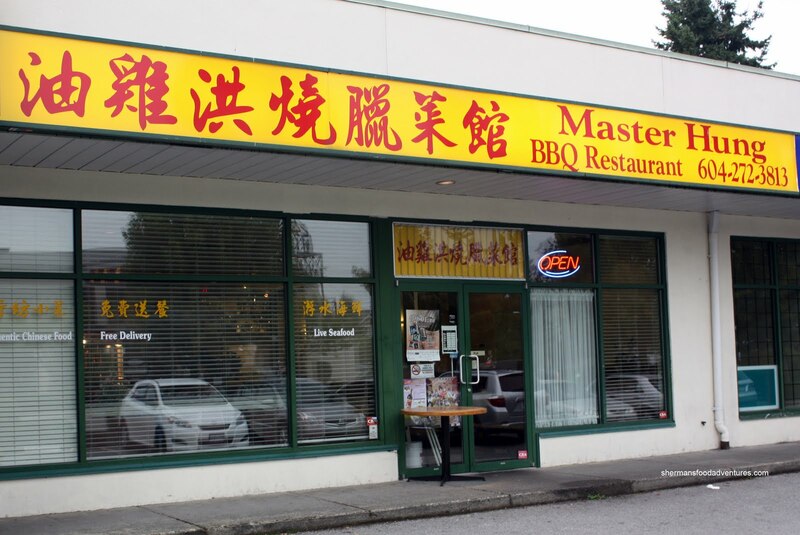 Never even heard of Master Hung BBQ. Wow the meat look great (ooops, is that a bad thing, having "hung" and "meat" so close together ? LOL). How do their BBQ compare to HK BBQ Master on Three Road beside Superstore ? No green onions. I think next time you have to be even more assertive with the waitress, saying if they bring your food with green onions you're gonna return it. We've been going here forever until one day someone mentioned it's chinese name which mentions "oil chicken" and I was shocked that we had never ordered it. So we did and it was good too. I just wished this place had set meals that come with the standard HK style drinks. LR, haha you're humour is quite similar to mine... I learned of MH from Ben. I think HK BBQ Master and Master Hung to be quite close. It's a toss up. Nah, if I'm too assertive, I'll get more than I bargain for! And green onions, I don't mind them, they just upset my stomach, that's all. Yow Gai? Yum, Gonna try next time! Just happened to eat there for lunch this week. 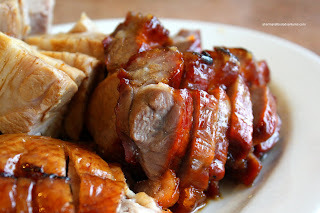 Not knowing anything about them, I ordered a 2 BBQ item-on-rice plate (only $7.50) consisting of roast pork and BBQ pork. Waitress brought me a huge bowl of consommé soup as a starter ("lai tong" in Cantonese), followed by a large plate of perfect fluffy rice topped with gorgeous slices of roast pork and BBQ pork, with a small side of blanched gai lan. Without boring you with all the superlatives about the food (I savoured every bite), I can at least say I've found *the* perfect Cantonese BBQ resto in Richmond. For the combination of quality and ambiance, MH beats HK BBQ Master hands down. Just thinking about those luscious melt-in-mouth, charred-edged pieces of BBQ pork is killing me right now. @LR I can't deny this place is good! But personally, I still prefer HK BBQ Master!